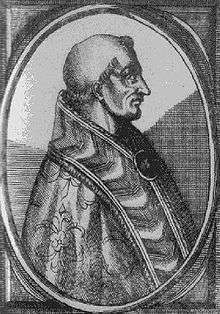 Pope Celestine IV (Latin: Caelestinus IV; died 10 November 1241), born Goffredo da Castiglione, was Pope from 25 October 1241 to his death on 10 November of the same year. Born in Milan, Goffredo or Godfrey is often referred to as son of a sister of Pope Urban III, but this claim is without foundation. Nothing is known of his early life until he became chancellor of the church of Milan (perhaps as early as 1219, certainly in 1223–27). Pope Gregory IX made him a cardinal on 18 September 1227 with the diocese and benefice of San Marco, and in 1228–29 sent him as legate in Lombardy and Tuscany, where the cities and communes had generally remained true to the Hohenstaufen emperor, Frederick II. He was dispatched in an attempt to bring these territories around to the papal side, but without success. In 1238 he was made cardinal bishop of Sabina. The papal election of 1241 that elevated Celestine to the papal chair was held under stringent conditions that hastened his death. The papal curia was disunited over the violent struggle to bring the Emperor and King of Sicily Frederick II to heel. One group of cardinals favored the ambitious schemes of the Gregorian Reform and aimed to humble Frederick as a papal vassal. Frederick, however, controlled as his unwilling guests in Tivoli two cardinals whom he had captured at sea, and in Rome Cardinal Giovanni Colonna was his ally, largely because the curia was in the hands of the Colonna archenemy, the senator Matteo Rosso Orsini. The latter held the consistory immured under his guards in the ramshackle palace of the Septizodium, where rains leaked through the roof of their chamber, mingled with the urine of Orsini's guards on the rooftiles. One of the cardinals fell ill and died. ↑ Miranda, Salvador. "The Cardinals of the Holy Roman Church: Consistories for the creation of Cardinals - 13th Century (1198-1303)". Florida International University. Archived from the original on 9 June 2012. ↑ San Marco was a diocese in southern Italy established in 1170. "Curia vescovile di San Marco Argentano - Scalea". Sistema Informativo Unificato per le Soprintendenze Archivistiche. Archived from the original on 13 May 2014. ↑ Bagliani 1972, p. ? ↑ Robert of Somercotes, an English cardinal, was the one who died during the conclave. Walsh, Michael J. (2003). The Conclave: A Sometimes Secret and Occasionally Bloody History of Papal Elections. Lanham, Maryland: Sheed & Ward. p. 81. ISBN 978-1-58051-135-3. ↑ Abulafia 1988, p. 352. This statement is unsupported by contemporary evidence. In fact, Matteo Orsini continued as Senator of Rome in 1242 and was Senator when Innocent IV (Fieschi) was elected; and his son (the future Nicholas III) was made a cardinal in 1244. Cf. Francesco Antonio Vitale, Storia diplomatica de' senatori di Roma I (Roma 1791), 108-110; Luigi Pompili Olivieri, Il senato romano I (Roma 1886), pp. 193-194. Reardon, Wendy J. (2004). The Deaths of the Popes: Comprehensive accounts, including funerals, burial places and epitaphs. Jefferson, North Carolina: McFarland & Co. ISBN 978-0-7864-1527-4. Abulafia, David (1988). Frederick II: A Medieval Emperor. New York: Oxford University Press. p. 352. ISBN 978-0-19-508040-7. Lexikon der Mittelalters, vol. iii, part 7 (On-line). Bagliani, Agostino Pallavicini (1972). Cardinali di curia e familiae cardinalizie dal 1227 al 1254. Italia Sacra vols 18–19. Padua, Italy: Antenore. OCLC 2205084. A standard account.